I am OBSESSED with these Loeffler Randall boots. They are classic and gorgeous, I could go on and on. Anyways, they retail for $695, so a bit of an investment. Steve Madden's Intyce is also an alternative, retailing for $148.95 (comes in several colors). Click on the photo for more information. 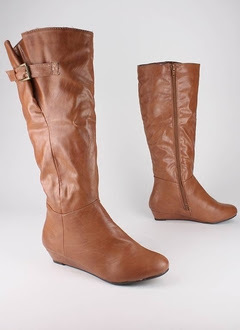 Go Jane also has an option in cognac or black for $30.80 - click HERE to purchase. And finally, if you don't like the buckle and want something closer to the Loeffler Randall original - Nordstrom has a great option in cognac or black which retails for $119.95. Click on the photo below to purchase. The Aldo ones remind me a lot of the Steve Madden Intyce! Check out the "stone" color. I was just going to say what Emily said- these boots look a lot like the Steve Madden intyce! I have them in cognac and they are quite comfortable- I also love the tiny wedge heel. Im so glad I invested in my LR boots, i bought them early this summer and ive only worn them once. fall needs to get here quick. However I love Aldo for other shoe look a likes that I dont want to invest in plus the quality is great.